Because it has no noticeable symptoms, glaucoma is a difficult disease to detect without regular, complete eye exams. 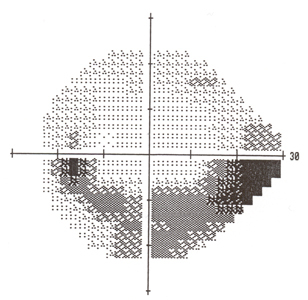 A visual field test, often described as a test of the side-vision, is part of a complete eye exam. 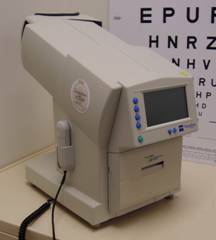 The visual field test (perimetry test), measures all areas of your field of vision, including your central as well as your side, or peripheral, vision. A visual field test can help find certain patterns of vision loss and is a key way to check for glaucoma or other diseases effecting the function of the optic nerve. To take this painless test, you sit at a bowl-shaped instrument called a perimeter. While you stare at the center of the bowl, lights appear briefly. These lights vary in their intensity at each location throughout the test. Each time you see a light you press a button using the hand-held clicker. A computer records the location of each flash and whether you pressed the button when the light flashed in that location. At the end of the test, a printout shows if there are areas of your field of vision where the lights had to be brighter than for the average person of your age. Loss of visual field in a ‘nerve fibre bundle pattern’ is often an early sign of glaucoma. Regular perimetry tests are an important technique for learning how, if at all, your vision is changing over time. It can also be used to see if treatment for glaucoma is preventing further vision loss. 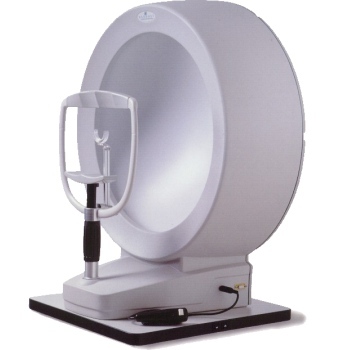 There is a screening version of visual field testing called the Frequency Doubling Technology perimeter (FDT.) This test divides the field of vision into quadrants then tests four quadrants within each of these quadrants for a total of 16 squares. This takes advantage of the magnocellular axons in the retina being specifically sensitive to the standing wave interference pattern created by two sine waves of equal magnitude. There is a second generation of this device called the Matrix perimeter which is a more sensitive test that also uses the same phenomenon but maps out areas of similar size and location of standard automated perimetry. A detailed discussion of FDT technology can be found at the Imaging and Perimetry Society website.